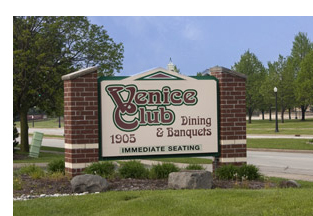 Due to financial struggles over the past year, the Venice Club closed on Friday, May 9 and after a long process of looking at other potential locations by Club Vice President, Tom Curl and President Gary Zwirlein, The Western Racquet Club was chosen. Part of the challenge was to find a location that was availble every Friday morning and was large enough to accomodate a group of our size, which can range from 50 to 80 people every week. Another thing to consider was the fee for the use of the facility and the meal cost that the Venice Club had been keeping the same for almost 8 years. Effective May 9th, Elmbrook Rotary is now holding their Friday morning meetings at the Western Racket Club in Elm Grove located at 1800 Highland Road. Fortunately the facility was available on short notice and is large enough to accomodate a group our size. The cost for breakfast is $14 which is higher than the fee the Venice Club has been charging but is comparible to other venues that were looked at, with several locations charging as much as $18. As we look back on all our years at The Venice Club, we want to thank the entire staff who has been there every Friday at the crack of dawn to prepare and serve our breakfast as well as get the room ready. Thank you for your service and best of luck in your future endeavors.